South Texas College of Law Houston recently earned the title of “Best Moot Court of this Decade” in a ranking published in the fall 2016 issue of preLaw Magazine. The school also received top recognition in the magazine’s fall 2017 issue, once again ranking #1 in the nation. In its feature, “Best Schools for Moot Court,” the publication highlighted schools that have excelled in moot court – an extracurricular activity in which law students argue mock cases in simulated court proceedings – since the Andrews Kurth Moot Court National Championship began tracking them in 2009. Also known as advocacy training, moot court activities enable students to apply classroom knowledge in a courtroom setting, hone their research and writing skills, and learn how to argue both sides of a case before a judge. Advocacy competitions help students learn to think like practicing attorneys and gain valuable, real-world skills that give graduates an advantage in competitive job markets. 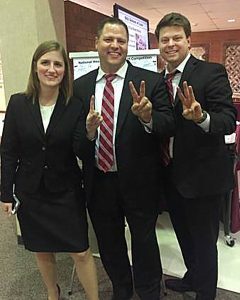 This month, South Texas College of Law Houston students Brad Eric Franklin, Hayley Hervieux, and Chase Newsom won the school’s 123rd national advocacy championship. No other law school in the United States has won half as many. South Texas is one of only three national law schools consistently ranked in the top 10 for trial advocacy by U.S. News & World Report. That said, advocacy training also benefits future transactional lawyers, as – by fully researching and preparing moot court cases – all students develop their confidence in the law, fine-tune their organizational skills, and learn to become better advocates for their clients. Data for preLaw Magazine’s annual ranking is entered into an elaborate scoring method that assesses the quality of the competitions a school participated in, the size of the competitions, and the school’s performance in those competitions. The top 16 national teams are invited to participate in the Andrews Kurth Moot Court National Championship, dubbed, “the best of the best” in moot court competitions. Using the compiled results, preLaw added the law schools’ accumulated points from 2011 to 2016 to identify South Texas College of Law Houston as the top advocacy school in the U.S. over the past decade. In addition to Treece, other administrators of South Texas’ Advocacy Program include Associate Director Rob Galloway, Manager Shaun Devine, and Coordinator Hayley Stenhouse.